Flight, it is a wonderful thing. To fly is to experience a mastery of the air, of new environments; a freedom of movement in three dimensions. It is wonderful to feel the air pressure through the controls (well perhaps not directly in the modern fly-by-wire aircraft like the Airbus), and to go places quickly, and relatively comfortably. As the poem High Flight goes, "Oh I have slipped the surly bonds of Earth...". Forty odd years ago a select few astronauts slipped those bonds and traveled, while not in comfort in the small Apollo CSM, but at least very fast, to the Moon. The outgrowth of the technology that made moon flight possible, has also made modern air travel possible. Modern airliners are controlled by computers that do all but the takeoffs and landings (thought they can also autoland the aircraft at suitably equipped airports in bad weather). This navigation technology was developed alongside that of Apollo by Charles Stark Draper of MIT Draper labs, with the Inertial Navigation Systems (INS) of the day controlling Apollo spacecraft and passenger airliners in similar ways. Today we have GPS for navigation, but if we returned to the Moon, we would probably still go back to using INS like in Apollo (or something new perhaps). We fly the skies of Earth, but we could go much further, to the Moon and beyond to Mars. It is a future that could have been. Today we could have been buying tickets to the Moon, just as the former airline Pan Am promised. 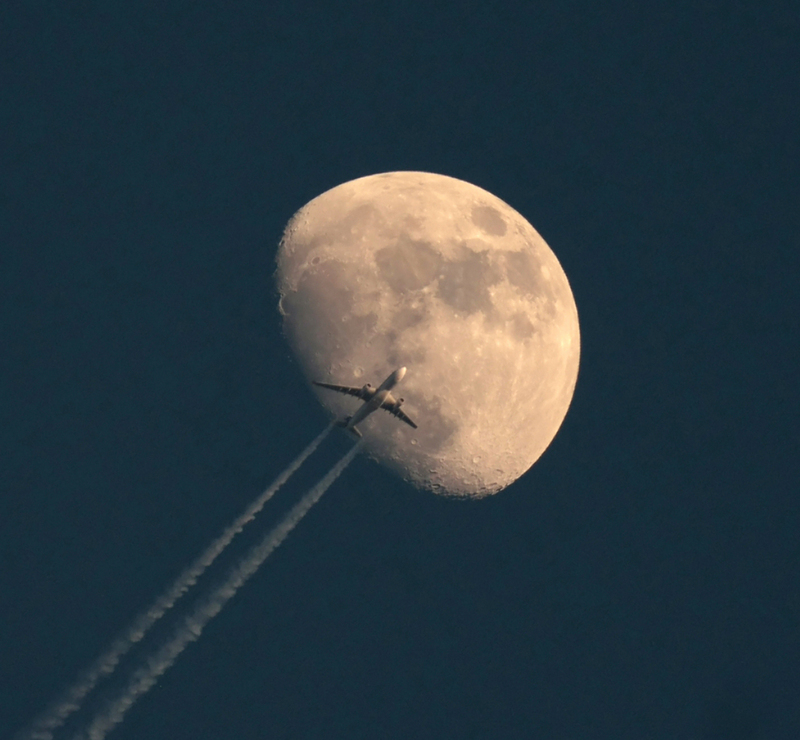 When we look up and see an aircraft by the Moon, we dream of flying there, if not today, then hopefully one day again. Details: Flight ALK503 from Colombo to London. Aircraft is an Airbus A330. Camera: Canon EOS 40D, ISO 400, exposure 1/640 sec. Yesterday's LPOD: One of Those Nights! This page was last modified on 8 February 2015, at 17:08.